Israeli President Moshe Katzav received a delegation of rabbis brought by JICI to discuss their Religious Peacemaking in the Middle East initiative, and expressed his support. At a public reception held by the JICI in London, Baroness Symons, Minister of State at the UK Foreign Office, also expressed her "heartfelt support" of the Religious Peacemaking initiative. A groundbreaking point is reached at JICI's Public Policy Research Department with the establishment of a Rabbinical Steering Committee (click for more information), composed of preeminent rabbis representing all main sections of Haredi society, and closely associated with leading Torah Sages. Jewish Solidarity: Antidote to Assimilation,a selection of Rabbi jakobovits' writings in English, is published by the JICI. A $35,000 grant is received from the Avi Chai Foundation in support of the Institute’s activities. Major preparations are made for the opening of the Center for Halachic Research on Contemporary Issues, including enlistment of senior research fellows, setting up a curriculum, and operational budget. Ongoing, thorough and wide-ranging dialogue proceeds in the framework of the Yachad Council, especially regarding organ transplants and life prolongation, and the Two Communities – One People Proposal. 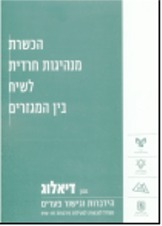 This includes a first annual Jerusalem Conference on religious-secular relations and an important JICI initiative: a first-time Rabbis and Medical Doctors Seminar, bringing together key rabbinical and medical figures in Israel, including the directors of major medical centers, the Chief Scientist at the Ministry of Health, and others. The background to this seminar is the lack of organ donors and a long-term crisis of credibility between the medical establishment and the highest halachic authorities. A seminar is held on The Tension Between the Haredi and the Secular Populations in Israel – as an Existential Danger, with the participation of Rabbi Shmuel Jakobovits, Rabbi Yeheskel Weinfeld, Major-General Uzi Dayan, and a large-numbered delegation of members of Agudath Israel of America. Rabbi Jakobovits initiates and helps run a training course to prepare young Torah leaders for Inter-Communal Dialogue; in cooperation with Manof, a division of Arachim. The course trains 45 outstanding young leaders in its first year. A $30,000 grant is received from the Avi Chai Foundation to fund part of the Institute’s activities. Rabbi Jakobovits plays a decisive role in the establishment of the Yachad Council and its installation as an affiliate of Beit Hanassi (the Israeli President’s House). The council, which is comprised of prominent members, meets regularly to discuss issues affecting modern life in Israel, including archeology, Sabbath observance, and organ transplants. The council is making steady progress toward resolution of these and other issues. Ura Kevodi, the Institutes’ founding association, receives the Year 2000 Award for Promotion of Secular-Religious Dialogue from the speaker of the Knesset and the Minister of Israeli Society and the Diaspora. Rabbi Jakobovits participates in the formulation of a government decision regarding the establishment of the Yachad Council for Secular-Religious Relations. Institute’s associates initiate efforts to increase education on Good Manners and Respectful Behavior (derech eretz) within the Ultra Orthodox community on the elementary school level. Rabbi Shmuel Jakobovits, Dean of the Institute, participates in the establishment and running of a forum entitled Toward National Consensus. The forum is attended by 400 people of diverse backgrounds who discuss issues of joint concern. The forum advances a number of initiatives aimed at reducing inter-sectoral conflict in Israel. A Conference of Torah Thinkers (Ve’idat Anshei Torah) is established to examine the Challenges Facing The Jewish Community In Modern Times. The conference, comprised of 25 leading educators, meets on an ongoing basis. The Dialogue between Worlds project is established in Jerusalem in cooperation with the Van Leer Institute. A conference of senior halachists is held regarding the topic Extending life. The conference is attended by 25 leading Jewish scholars, including Rav Zalman Nechemiah Goldberg, Rav Avigdor Nebentzal, and Rav Shmuel Eliezer Stern, a member Rav Wosner’s Beit Din. A conference is held under the auspices of the Jerusalem municipality involving intellectuals from the Torah community on the topic: Is dialogue possible in Jerusalem? Some 120 people attend, with Rabbi Shlomo Wolbe and Mayor Ehud Olmert addressing the conference. Ura Kevodi is founded as the Charedi Association for the Study of Contemporary Issues, with the ultimate aim of creating the Harav Lord Jakobovits Torah Institute of Contemporary Issues. Reacting to public furor over a sharp rise in haredi power in an Israeli election, Rabbi Shmuel Jakobovits initiates a groundbreaking effort to evaluate the feasibility of haredi-secular intellectual dialogue. His paper written in this connection on The Normative Haredi Attitude to the State of Israel is greeted with skepticism by non-haredim, but with general confirmation by haredi Torah scholars and leaders, most notably by the leading Torah sage, the late Rabbi Shach, of blessed memory.